Choose a location on the map. It must be some spot other than your current location. You can search for a spot, type a location, or long-press any part of the map. Choose a card from the search results. This process works identically to finding a location. The Route icon can look like the icon shown, but most often it looks like a car. Ensure that My Location is chosen on the next screen, similar to what’s shown. If you don’t see My Location, touch the top entry (where My Location should be), and then choose the My Location item from the next screen. Choose a card representing the route you want to take. Sometimes only one card is available, but others may appear. The variety depends on traffic conditions, toll roads, zombie attacks, and similar things you might want to avoid. While navigating, the phone displays an interactive map that shows your current location and turn-by-turn directions for reaching your destination. A digital voice tells you how far to go and when to turn, for example, and gives you other nagging advice, such as to sit up, be nice to other drivers, and call your mother once in a while. To exit navigation, touch the Close icon at the bottom of the screen. The neat thing about Navigation is that whenever you screw up, a new course is immediately calculated. When you tire of hearing the navigation voice, touch the Action Overflow icon and choose the Mute Voice Guidance command. The phone stays in navigation mode until you exit. A navigation notification can be seen atop the touchscreen while you’re in navigation mode. You can touch the Action Overflow icon while navigating and choose Step by Step List to review your journey. The Route Preview command lets you see the big picture. 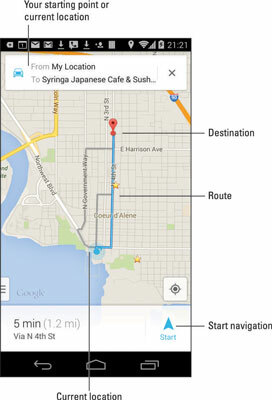 In navigation mode, your phone consumes a ton of battery power. Plug the phone into your car’s power adapter (the “cigarette lighter”) for the duration of the trip.